When adding or editing a livestock tracker in a scenario you have the ability to edit the default valuations as well as the birthing and death percentages. Clicking the Configure button when inside your livestock tracker will take you to the livestock management page. You can enable whether each tracker will calculate automatic ageing between the stock classes. You can also specify whether or not the birth & deaths will be automatically calculated based on the percentages shown below. 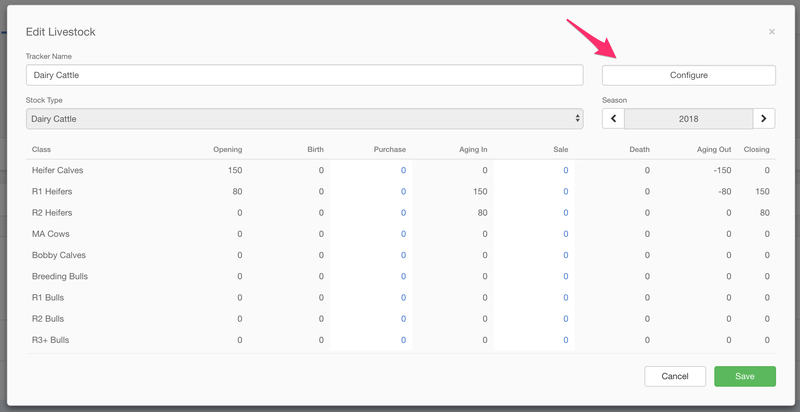 If you choose to turn off automatic ageing, births or deaths - you'll then have the ability to clear out the existing data with the Clear Quantities option, this will default to ticked and clear the existing data, zeroing out your birth/deaths/aging quantities. Alternatively, you can untick the Clear Quantities option, this will mean the transactions will still be created but you will be able to edit/adjust them in the tracker. Default valuations are shown for each stock class, these can be edited as you see fit. At any stage you can reset to the system defaults by clicking the Use System Defaults button. Once you have made changes click Save and then the Back button on the top right to return to your scenario. Default birth rates are shown for each applicable stock class, these can be edited as you see fit. The birth rates shown will mean that the quantity of birth into each stock class will be automatically calculated. Default birth rates are shown for each stock class, these can be edited as you see fit. The death rates entered will mean that the amount of deaths from each stock class will be automatically calculated.